All or part of 43 Pennsylvania counties are in the Chesapeake Bay watershed. Across these counties, community residents are working hard to reduce nitrogen and sediment pollution levels in streams and rivers. They’re coming together to hammer out a plan they’ll submit to DEP called a Phase 3 Watershed Implementation Plan—or Phase 3 WIP, for short—that specifies pollution-reducing actions they’ll take. These Pennsylvanians are helping their communities in a big way. They’re also helping the state meet federal requirements for water quality in the Bay. Lancaster County starts us off. Watch for other county contributions to follow. And if you agree there’s much to be proud of in your community’s efforts, help spread the word by sharing their posts with friends and neighbors on social media. Use the hashtag #healthywatersPA. Taking the lead in county Phase 3 WIP plan development: Lancaster Clean Water Partners—more than 100 partner groups —are focused on making Lancaster County’s streams clean and clear within our generation. Folks leading our effort include Joellyn Warren, West Lampeter Township and Lancaster County Clean Water Consortium; Ruth Hocker, City of Lancaster; Justin Evans, Mount Joy Township; Mark Huber, Lancaster County Planning Commission; Brian Gish, Chesapeake Bay Foundation; Joe Sweeney, Water Science Institute; Peter Hughes, Red Barn Consulting; and Jeff Hill, Matt Kofroth, and Chris Thompson, Lancaster County Conservation District. 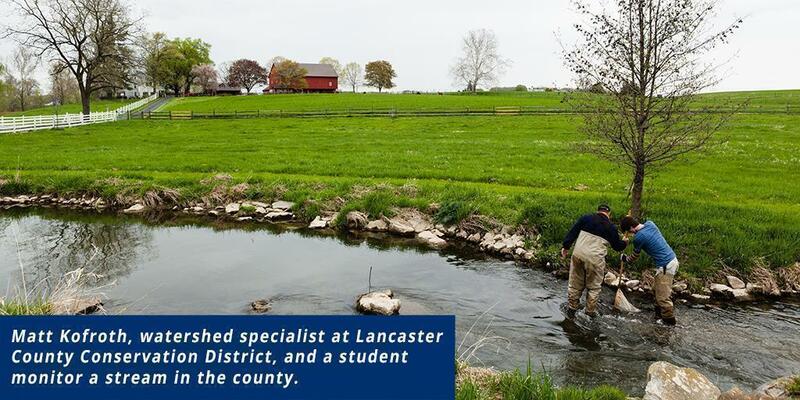 Healthier streams and rivers mean: Healthy waters mean better quality of life for all of Lancaster County--the bugs in the stream, the microbes in the soil, and the people in the landscape. One thing we’re especially proud of: We’re especially proud of the positive, respectful conversations among all partners at both small group and large public meetings we’ve had. The extensive collaboration that Phase 3 WIP planning requires takes some getting used to, but everyone wants to see our waters clean and clear, so they’re open to this collective process. Main areas we’re focusing our planning on: We really need a centralized data system for restoration, agriculture, and stormwater best management practices, as well as better documentation of practices that are already on the ground so we get credit for the amazing work that has been done. Our big pluses: Lancaster County residents have a strength and determination to succeed, no matter the situation. We see Phase 3 WIP plan development as an opportunity to create a local strategy to make our county’s streams clean and clear within our generation. We’re grateful for the amount of Lancaster-specific data we have (though could always use more), so that we can really customize our approach. This is key to success. In addition, because Lancaster County presents the largest opportunity for Pennsylvania to make progress on its clean water goals in the Bay watershed, we’re a logical choice for additional funding and resources. Our top challenge(s): And we are in need of additional funding and resources. The rate at which we need to scale up conservation efforts to meet a target 11-million-pound reduction of nitrogen in 6 years is the biggest challenge. County, state, federal, and private resources/funding will need to likewise scale up, if Lancaster County is going to lead the way with the local implementation efforts. We need more support. We’re thinking outside the box on: We’re trying to think innovatively about having streambank vegetation buffers become the norm on public lands, how to tackle stormwater permits at a watershed level, local nutrient management options for agriculture, and how our municipalities can partner with farmers to achieve real reductions. The key to our success will be: Our success will rely on continued local participation in both developing our county Phase 3 WIP plan and then implementing it. Increased technical and financial support. A broader engagement across sectors, so that clean water rises as a priority county-wide.